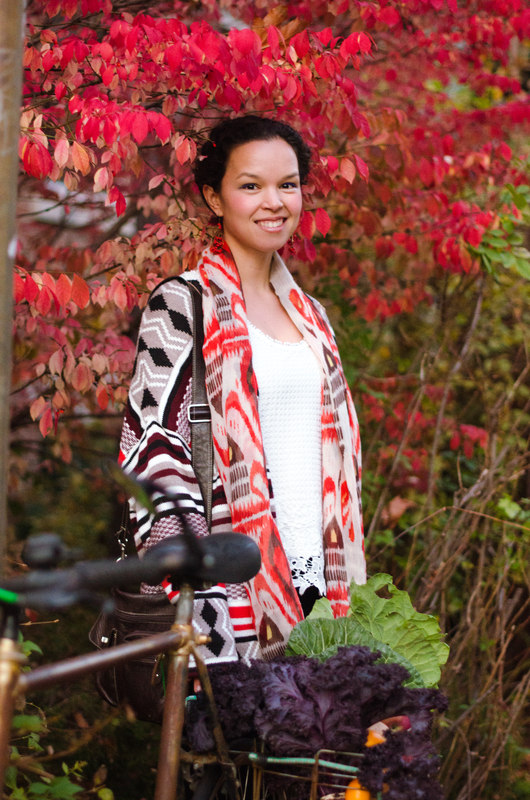 Have you ever heard of a supper club? 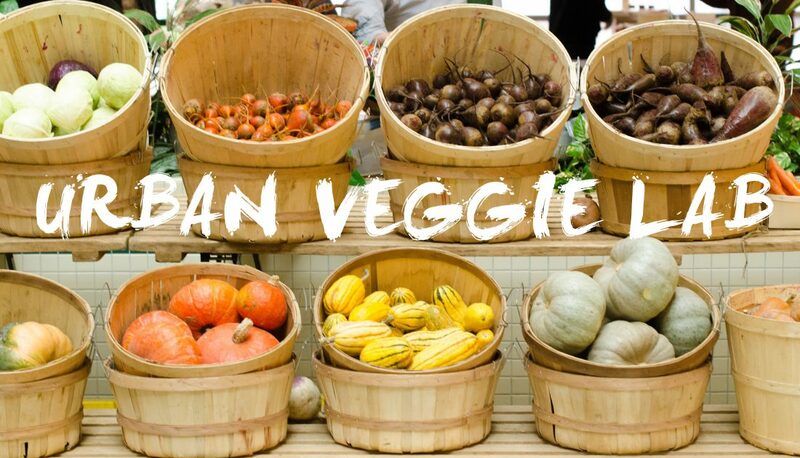 No, it’s not a new Costco promotion, but a new yummy trend hitting Toronto’s foodies by storm. I couldn’t wait to take part in one, so I signed up for an event called the Calabrese Supper Club hosted by the funny and always elegant chef Massimo Bruno at his studio location here in Toronto. 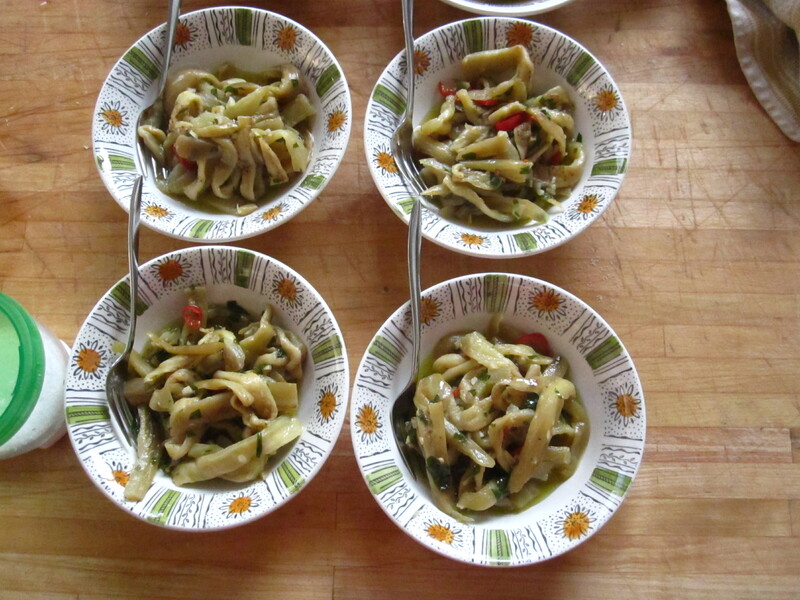 This event featured delicious Calabrese food served to 30-40 ravenous Torontonians. It was a meal to remember. 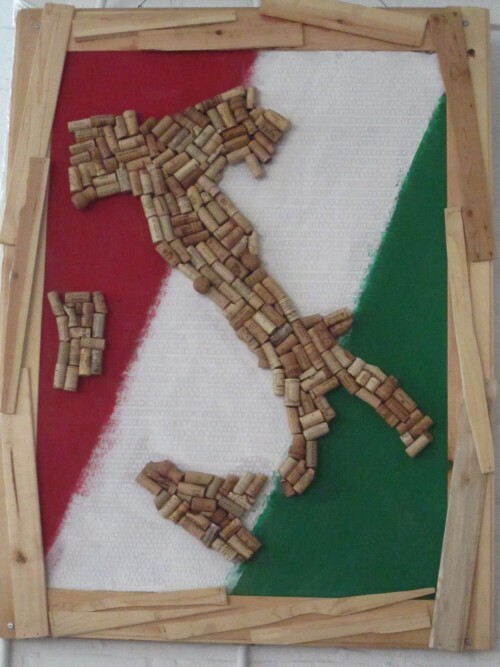 Calabria is in the south of Italy, known locally as the “toe” of the boot of Italy. It is a very mountainous region surrounded by the Tyrrhenian Sea and the Ionian Sea which has come to define many elements of local food. With water on almost all sides, the cuisine of this area is rich in fish, olives, hand-rolled pasta, peppers, tomatoes – all the good stuff. Tell me your mouth is not watering already? Did you know that Calabria produces 33% of all the olive oil from Italy? Also, Calabria has the second largest amount of organic farmers as compared to the other regions in Italy? If I didn’t have a job here, I would move there tomorrow! 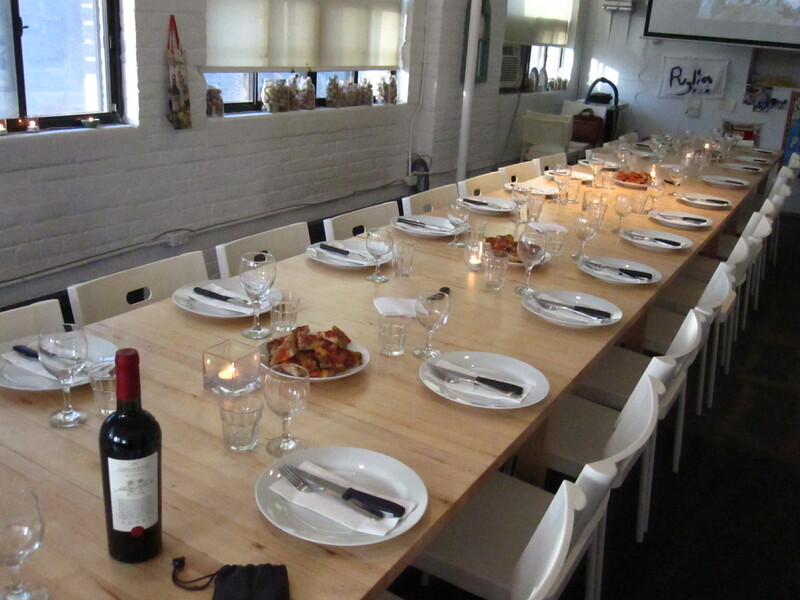 Anyhow, the evening started with a lovely table set-up in a cosy studio in Toronto. In no time the appetizers were out in full swing! 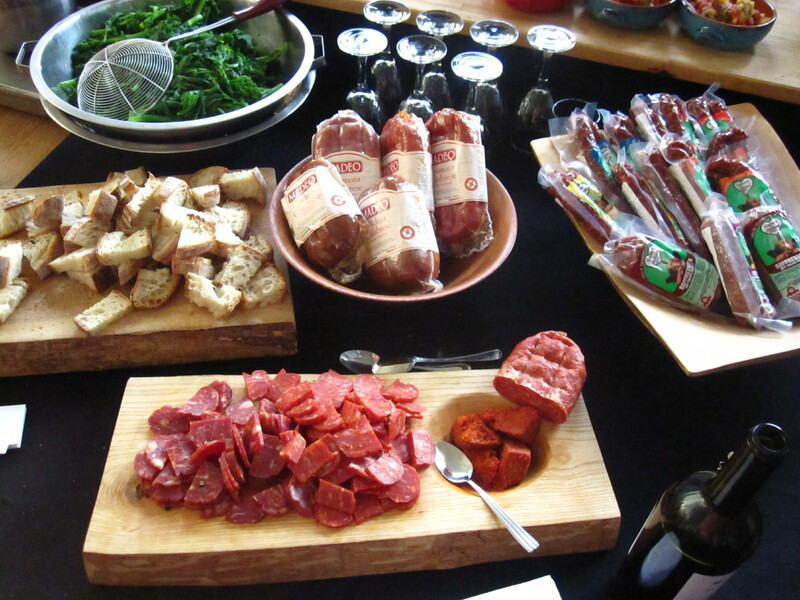 What better way to start the meal than with some soppresata salami from Calabria, and a speciality called ‘Nduja, which is a spreadable salami made with different cuts of pork, roasted peppers and a mixture of spices. 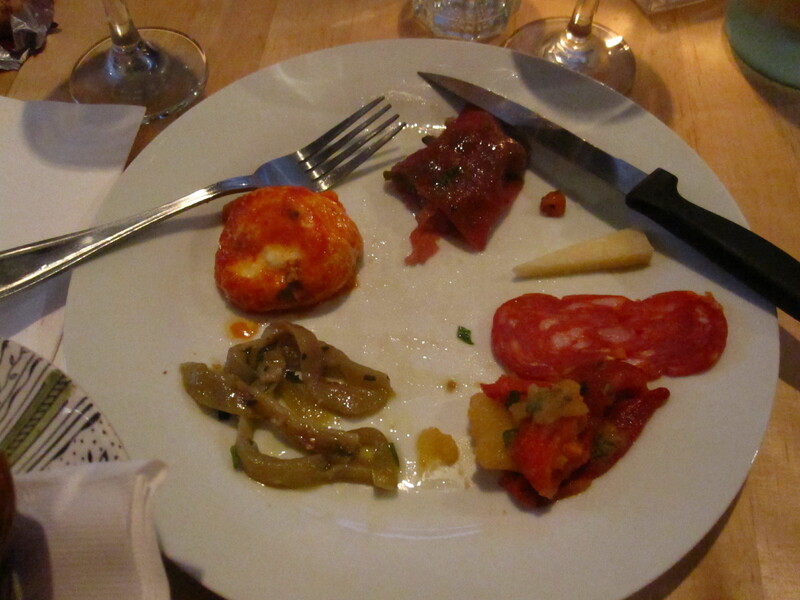 This was delicious (we even charmed one of the staff to sell us one of the packages of ‘Nduja you see above at centre). 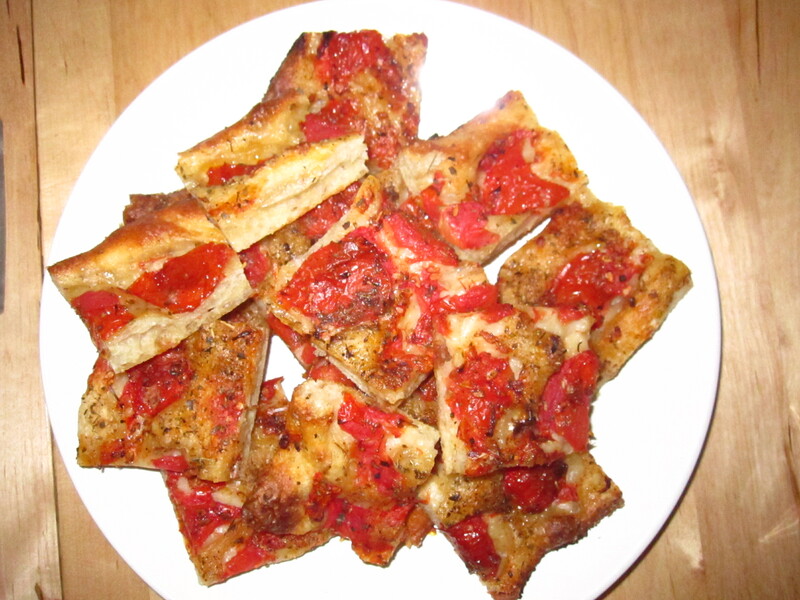 As a starter we were provided with focaccia, a flavourful bread made with lots of spices, olive oil and tomatoes. 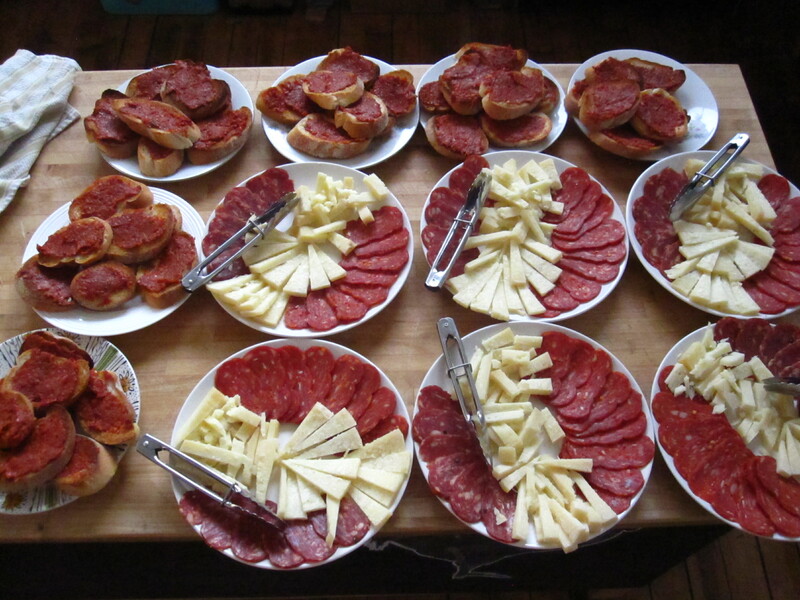 Piatto di sopressata e pecorino and ‘nduja crostini (typical calabria style sopressata style salami with sheep milk cheese from Crotone). Don’t you love the layout? It’s food art! Melanzane sott’olio (Pickled eggplant): Chef Massimo Bruno pickled the eggplant himself (and gave us some Italian secrets on how to make it). The eggplants were pickled for 3 weeks and soaked in olive oil, vinegar and a delicious mixture of spices. You really didn’t taste the eggplant at all, but a delicious pickled mixture that coupled with the heavier next course perfectly. La Peperonata (charcoal roasted peppers and potatoes): This is a staple of the Calabrese diet. 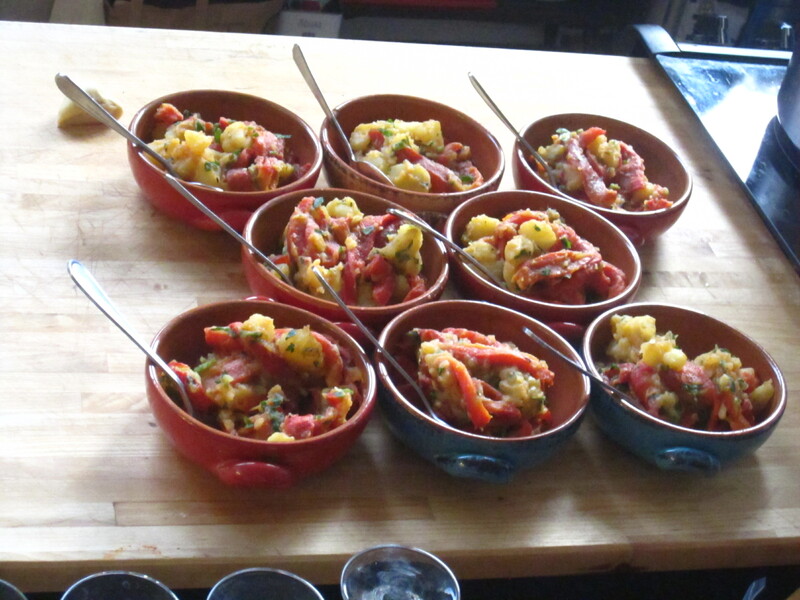 La peperonata consists of overcooked potatoes mixed with roasted peppers and tomato sauce. Traditionally the peppers are thrown right into the fire to give it that charcoal flavour and marking. Polpette di Ricotta (Ricotta balls in tomato sauce): These balls were out of this world (I am aware of how funny that sounds). 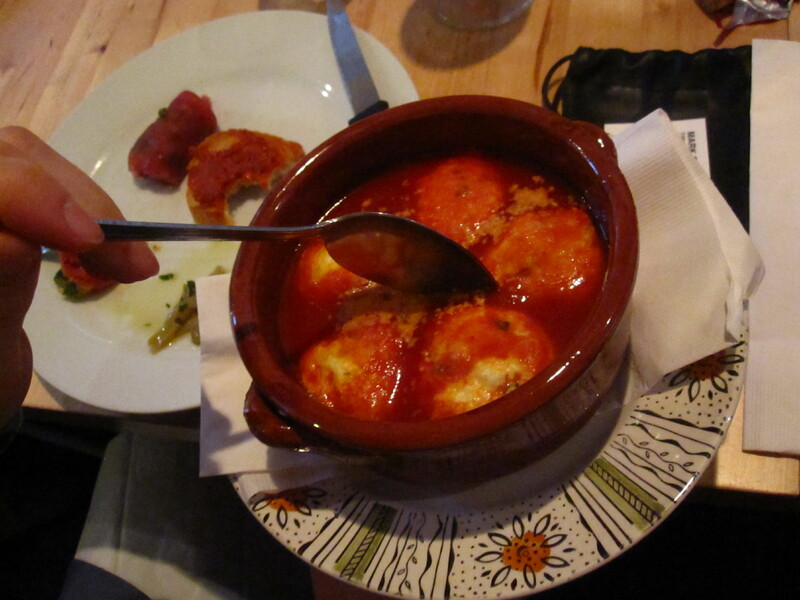 The ricotta balls were full of flavourful herbs, and the ricotta balls melted in your mouth! I will definitely try to make these soon. 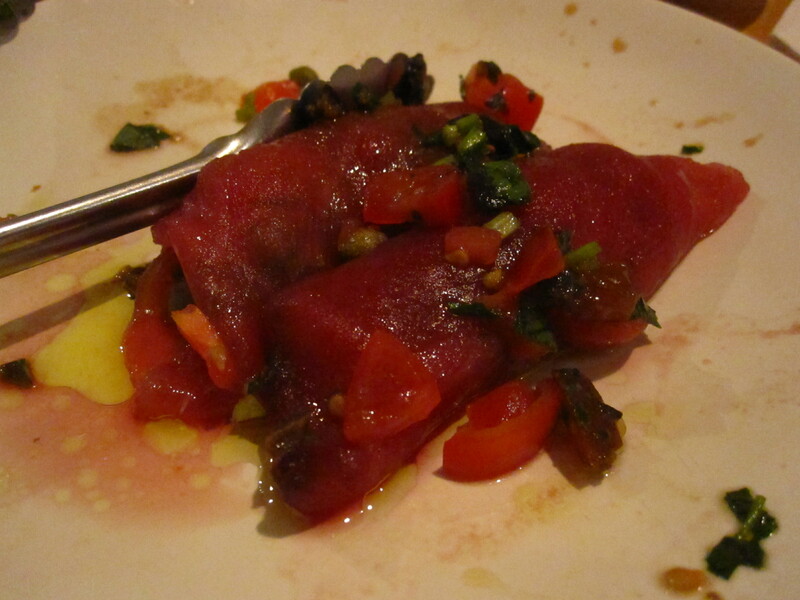 Involtini di Tonno (sushi grade tuna stuffed with olives, capers, tomatoes) for a nice fresh pallet cleansing moment before the heavier dishes. 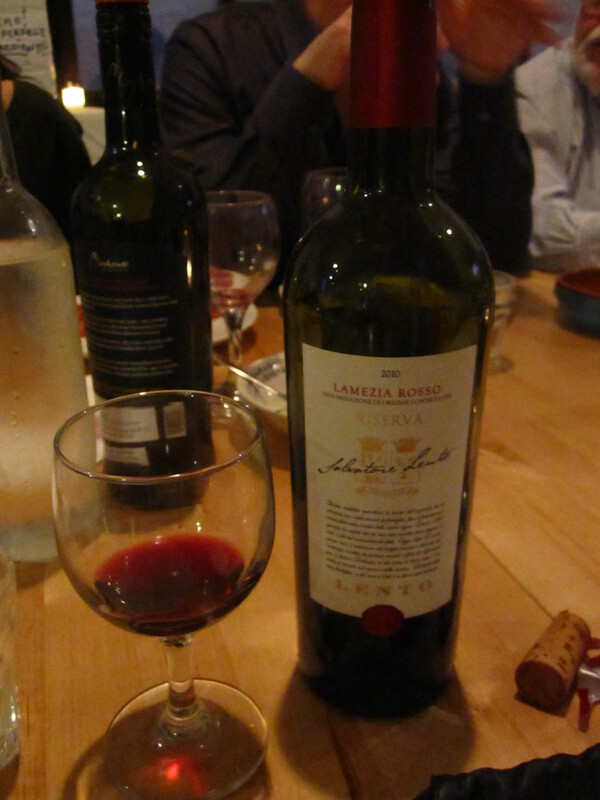 We bought a calabrian wine to go with the meal and found it to be quite nice. The taste was unique with a good depth of flavour. We’d definately buy it again! And now for the pasta course! 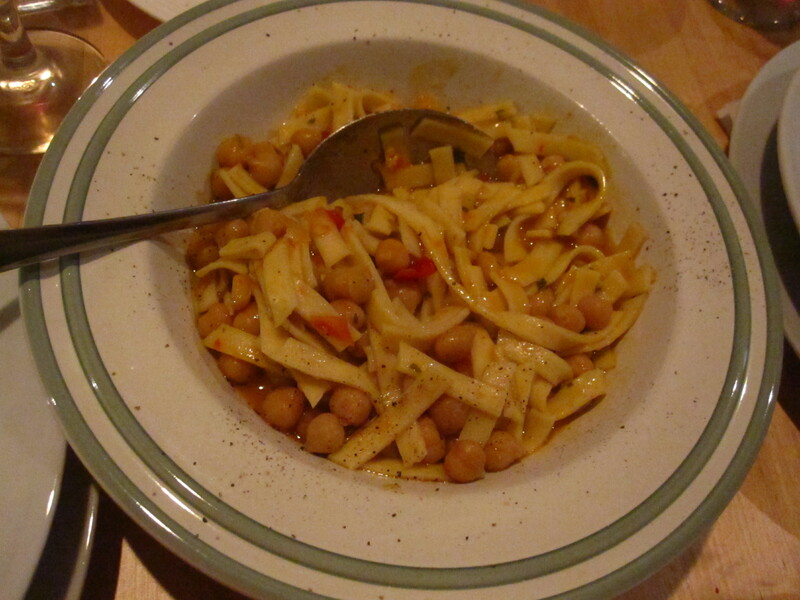 Pasta e ceci (broken fettuccine with chickpeas): This dish is such a simple dish that is very common in Calabria, but the depth of flavour in the dish cannot be described, it must be tasted! Each constituent flavour could be tasted and even a small portion was filling enough. 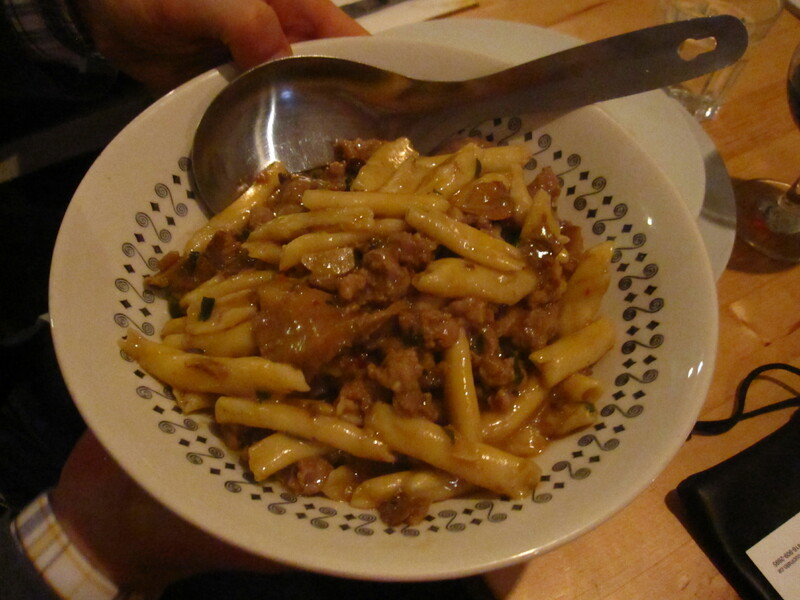 Maccheroni al ferro with Porcini, sausage and ‘nduja (handmade pasta with porcini mushrooms, pork sausage and a spicy spreadable pork sausage): This was actually my favourite dish, the pasta was handmade and the flavours of the pork and porcini mushrooms were so vivid. The dish was bursting with flavour and the pasta was amazing! This picture doesn’t show it, but I liberally sprinkled some parmesan on the dish as well. 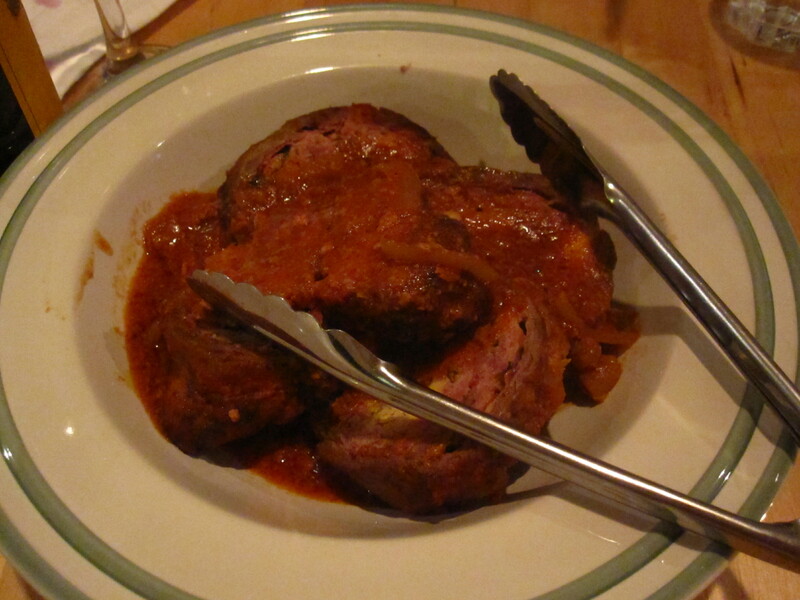 Braciolone alla Silana (stuffed veal rolls with tomatoes): Again, rich in flavour with the veal as the star of the dish. The veal was wrapped in prosciutto which provided for a really nice flavour contrast between a strong meat and salty edge. 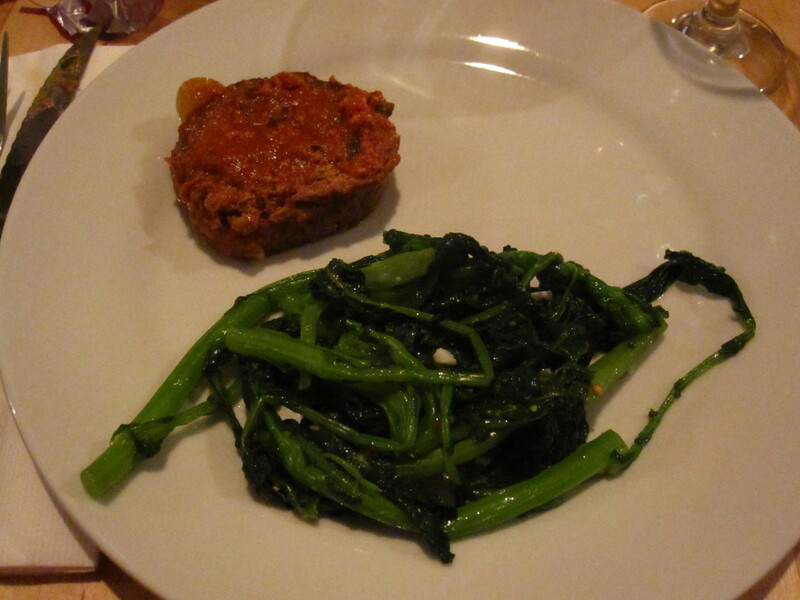 We has stuffed veal rolls and spicy rapini for the final course and again, everything was perfect. Important to note (and this may be a Calabrian thing), this was the only vegetables we had all night. I didn’t mind! 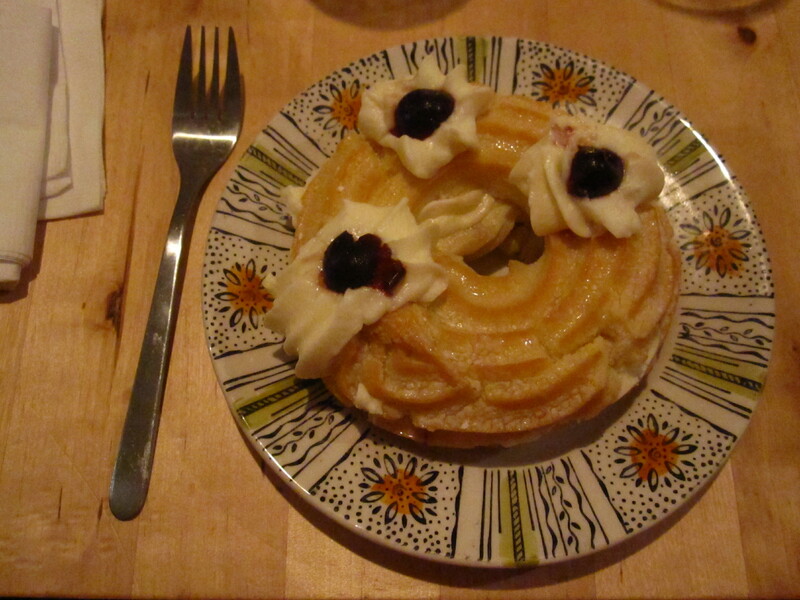 Finally, dessert! Phew that was filling even going through the pictures again!